South Africa was an important stopover for President Ngoombujarra, not only for an opportunity to view the world famous game parks, but also to cultivate new relations with neighbours far across the Indian Ocean from Westralia. 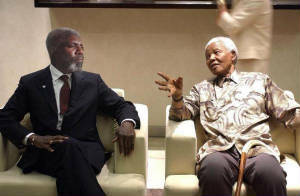 This gave President Ngoombujarra time for informal and pleasurable meetings with the one of the world's true statesmen, Nelson Mandela. The meetings were also very valuable for President Ngoombujarra to learn the struggles of a new fledgling government taking over the reins of an estblished economy. It was also a time for President Ngoombujarra and former President Mandela to share comparisons of fighting for social justice and in paying the price with loss of freedom. 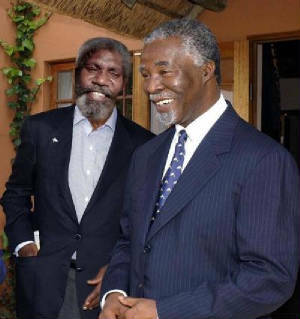 While President Mandela was thrown into Robben Jail after achieving his qualification to the Bar, President Ngoombujarra noted the parallel of his time in Roebourne Jail after seeking justice at the bar. It is only through the long and persistent fight by dedicated individuals who realised that they had to pay the price to unjust and morally corrupt regimes that that citizens would become aware of their own humanity being stolen from them. While South Africa's true leadership was exiled in Robben Island, the majority people of South Africa suffered a cruel government in denial. The situation for the President of Westralia.Net - Virtual Nation has been not much different. While the true leadership of a promised land is exiled to cyberspace, the citizens are sold lies of transparent accountability, and government for the people. ...But the deaths of hundreds, maybe thousands of our small population tell another story of callous mismanagement; Citizens poisoned to death by the real government, never told of contracted diseases, babies poisoned before they are born, all with the knowledge of the bureaucracy and government in denial of their own evil immorality. 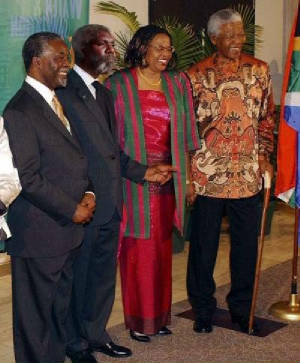 It was in this context that President Ngoombujarra's visit to South Africa was focused. To observe the transformation from a government of pariah dickheads, to one lead by a universally admired leadership. A nation of which all its citizens will be proud, and a society that other communities wish to emulate. ...Fortunately, in just about every other aspect, Westralia is way ahead of South Africa. All we have to do is move the dickheads out. Young Children Entertain the Guests. TIMBAVATI LODGE - NATIONAL GOLD AND DIAMOND AGENDAS: While taking an informal break of 10 days in the famous Kruger National Park, the two Presidents formulated complimetary national policies for each nation's gold and diamond production industries. While both nations are key global producers of these commodities enabling stable supplies worldwide, considerations and possible game-plans were discussed in regards to emerging production from Russia and the less politically stable countries to South Africa's north. Both Presidents believe it is in each nation's interest to work together in maitaining world leadership in production technologies and the continued involvement in exporting exploration expertise to new national producers, in order to be at the leading edge of shifts in the market balance. Westralia gold companies are already leading the way in providing assistance to West African countries in establishing profitable exploration, mining, and processing operations, with smaller operators heading north to Russia, testing and adapting established processes in different climatic environments. President Ngoombujarra's stopover in Canberra was brief, as the President was under Westralia.Net Administration instructions not to upset our real territorial host. However President Ngoombujarra was able to spend some hours with Australia's Prime Minister, John Howard. Our President congratulated Mr. Howard on his recent electoral win at the national polls. Mr. Howard held a press conference for visiting junior primary school magazine students who were in the vicinity, and stated his apology to the indigenous people of Westralia for past treatment by the Australian government. President Ngoombujarra accepted Prime Minister Howard's apology on behalf of all Westralia's citizens, before security officers requested that both the little school children move along. ...Leaving Australia's Prime Minister to bid farewell admiringly to his continent's first locally produced Head of State. It Was An Emotional Farewell From Prime Minister, John Howard.